Fire Station 63 Pancake Breakfast is This Saturday! - Yo! Venice! Home Abbot Kinney Blvd Fire Station 63 Pancake Breakfast is This Saturday! Fire Station 63 Pancake Breakfast is This Saturday! On Saturday, May 11th, from 8am-noon, The Los Angeles Fire Department’s Station 63 will hold its annual pancake breakfast at the station house on the corner of Venice and Shell. 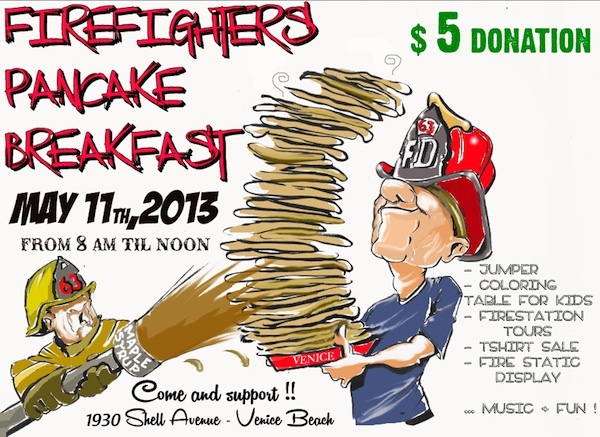 Support our Venice Firemen! While you are there, make sure you pick up one of their awesome shirts! They come in kids sizes too!